I've touched on this idea a lot here. It's something I struggle with in a lot of areas in my life. My inability to focus on a specific goal until that goal is reached before changing it to another "new goal." It's a merry-go-round, really. And, I need to get off this ride. I've been quiet for a while. Random blog posts here or there, but never saying anything of sustenance. Regurgitating the same complaints - ideas - goals. It's been kind of depressing, really. Some of it is my inability to be honest about how I really feel. Some of it was needing to keep certain aspects of my life offline. Some of it was just sheer frustration with, well, everything. Then, I took part in The Habit Course beta test. I picked a really easy habit and four weeks later - it really is a habit. I don't think about it anymore. It's done before I even realize it's done. Grant it, I haven't lost any weight - but I'm aware of what I'm doing. I'm ready to plan the next step. This is my 4th week of the daily habit. I've got this one down. I'm ready to focus on the next little thing. So, what's next? Well, I don't know today. This would be a planning week - to determine what my habit change should be and the steps I need to do to be successful. I'll reveal the new habit later this week. In other news, I managed to make it to CrossFit this morning. It's been about 3 weeks since I've made it. 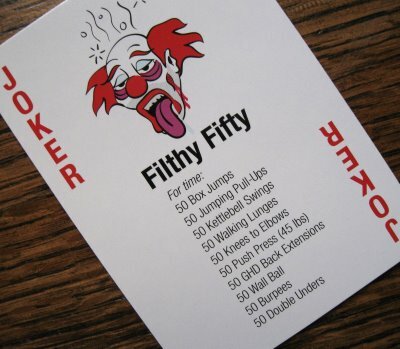 I "accidentally" checked the WOD last night and almost talked myself out of going back this morning when I saw that the workout was Filthy Fifty. Seriously, who goes back to CrossFit on that WOD? But, when 4:30 rolled around and the alarm went off, I couldn't think of a single reason to not get up and go. Sure, I came up with 50 excuses, but in the end, they were all just excuses. So, I went back in there and did my best. And my best was a RX on the workout, yes, even the double unders in 42:04. Not a competitive time, but it was my first time through this workout and after three weeks off, I'm still damn proud. And, there's a lot of room for improvement! Running has been non-existent for most of the last three weeks, too. Considering I only have a half marathon on tap for this year, I'm not going to stress about missing three weeks. I'm simply going to get on the horse and adjust as necessary. I did decide to do a little focus on form. I exert a lot of extra energy with my run form. I know my form is bad. I tend to shuffle my feet. My stride is usually shorter than my walking stride. I tense up through my shoulders. Yeah, just a hot mess. CrossFit uses the Pose Method as their form guide for running and I have spent quite a few hours watching the technique videos and reading what I can. I have decided - this is not something that I can fix on my own. So, with a little digging, I found that there is a Pose Method six week seminar/clinic starting June 1 through a local CF affiliate. And, I signed up. So, from June 1 - July 6, I will be spending a couple of hours learning the basics of how to run.